Every once in a while I come across something trivial that I obsess over. I must collect every single issue, piece, or version of it. It's usually some form of media and that holds a nostalgic quality. 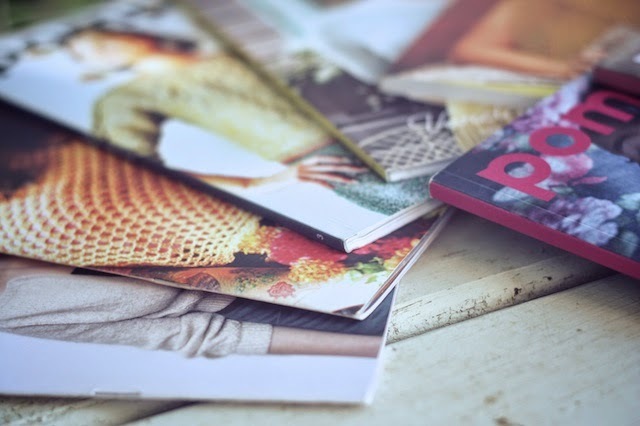 One year, it was reclaiming the Sassy magazines I read, with serious misgivings, as a teenager. (I know, I know.) Another year it was finding every episode of China Beach online because it will never be released on dvd. At one time, I recorded every story I could get my grandparents to tell from their childhood. Obviously, these obsessions come in varying degrees of importance. Sometimes it's something like finding my favorite childhood songs on vinyl. 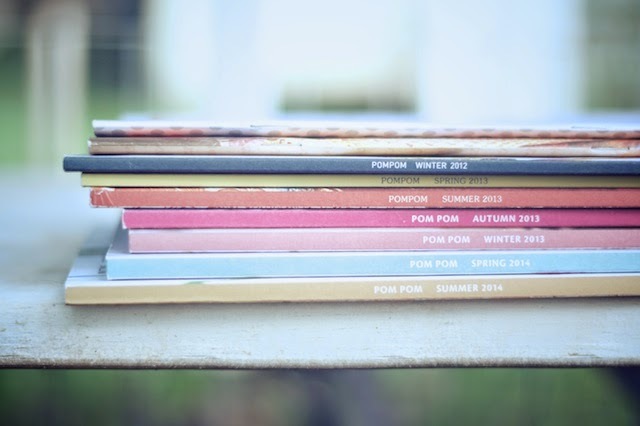 This year it was finding all of the print copies of Pom Pom Quarterly before they're gone forever. 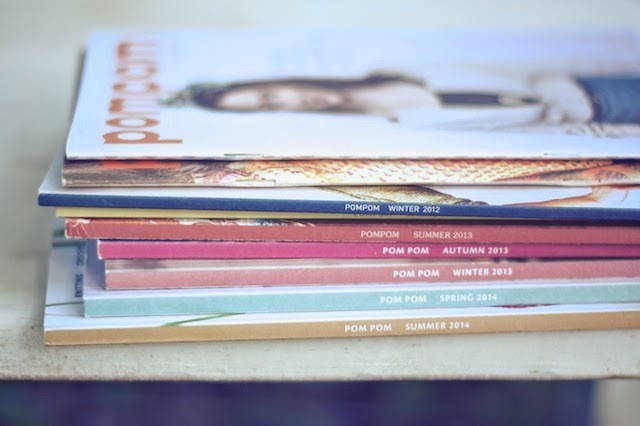 I waited too late to start subscribing to Pom Pom. I bought issues 3 and 4 to try it out. When I saw the quality of the print, illustrations, and patterns, I subscribed and snagged issue 2 at the same time. Issue 1, however, was already sold out. 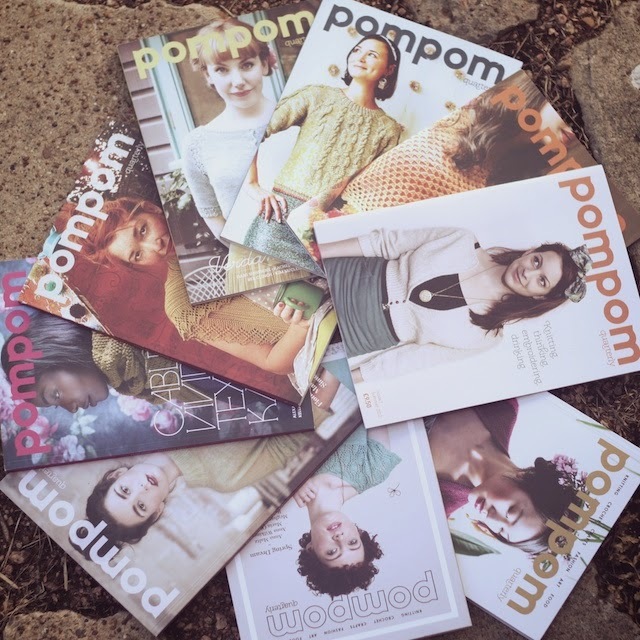 I did try the websites of the American stockists on the Pom Pom website, to no avail. I figured I'd just have to wait a few years and maybe one would show up in a book de-stash on Ravelry. Then I read Lori's blog post about completing her collection and decided to follow her example by emailing every, single shop on the stockists list to see if they had a stray copy. I was amazed that they all responded. They all said no; but, hey, they took the time to respond! I took it a step further and ravelry messaged Lori to see where she'd found issue 1 and she happily gave me the name of the shop. I decided to try calling them and found that they did have at least one copy. Within a few days it was on my book shelf, crammed in next to all of the other craft books that make the shelf sag. Yeah, I needed more stuff. My first knits from the collection will be the Riverine Pullover ,by Andi Satterlund, and Ananas Comosus, by Sarah Garry, which I'm knitting very soon. But I have Garland and Waterlily, queued up, too. It's not a big deal, just a little happy thing that happened with the help of generous people (Thank you, Lori!) and it lifted my spirits. Apparently I've really been missing out buy not reading these magazines! I'm off to check out the digital versions and add more to my must-knit list. Hope you're well, friend! I am doing well, Kristen. Thanks! I love these little magazines. At one time I was trying to do only ebooks for knitting patterns, but i just completely gave up when I got these. They're just so nice. The e-versions are great too, but if you buy the print copy, you get a code for the ebook too. I think they are are filling a void in the craft world with this magazine. I seem to like each copy better than the last. Congrats on being part of the latest issue, Sarah! 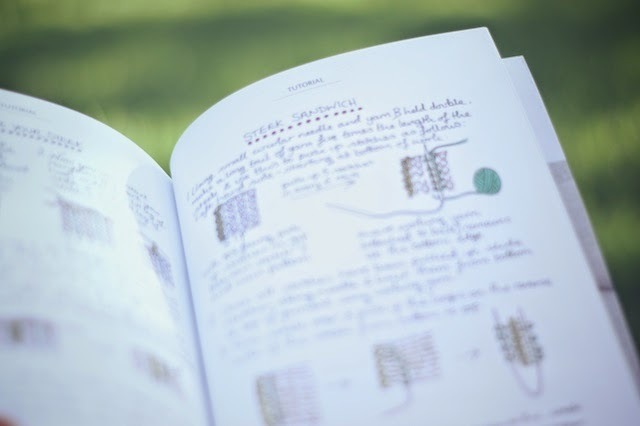 I'd be over the moon if I had a pattern in a book like this :) I can see a Creamsicle in my future. The name alone is appealing in this heat!